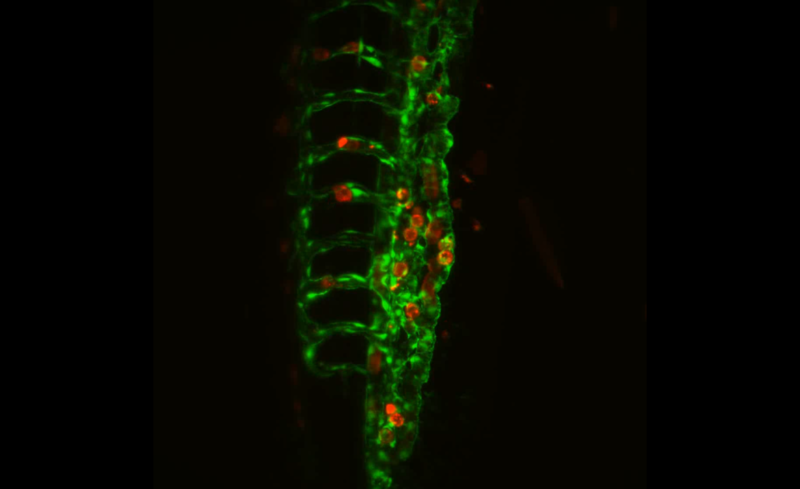 For NC State’s first-ever research image contest, we received scores of submissions from graduate students and postdoctoral researchers, representing six colleges. Entries were made in three categories: graphics and illustration; photography and microscopy; and video and interactive. The high quality of the submissions made it difficult to choose winners, but we ultimately chose a first- and second-place winner for each category – as well as two “honorable mentions” for each category. More information on these winners is below. Below you will find the winning entries and descriptions of the winners’ research projects. Note: All images are resized to fit the dimensions of this webpage. View all images in the flickr gallery to see the complete work. Description: This is a wild queen bumble bee (Bombus griseocollis) found at the JC Raulston Arboretum this past spring, here in Raleigh. In the Irwin Lab, we are interested in the influence of secondary compounds in both nectar and pollen on bee disease. 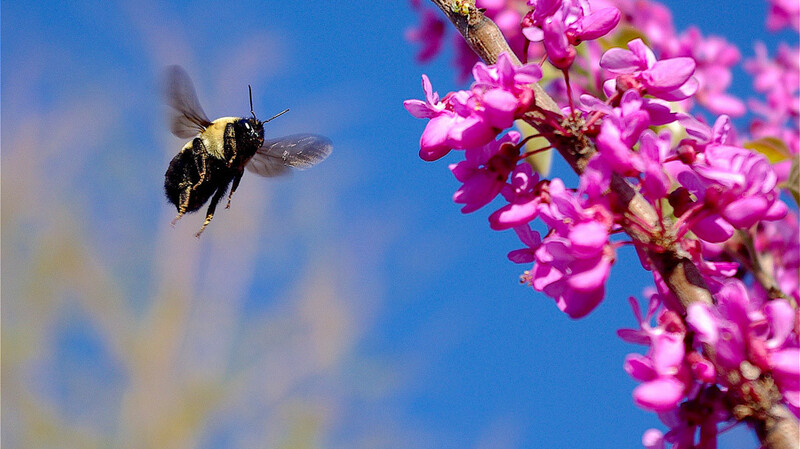 Often, such compounds are extremely toxic, yet some have been shown to reduce parasite loads in some bumble bees. Description: This is a crystal bridge that is reaching over a “river” of crystalline sapphire. 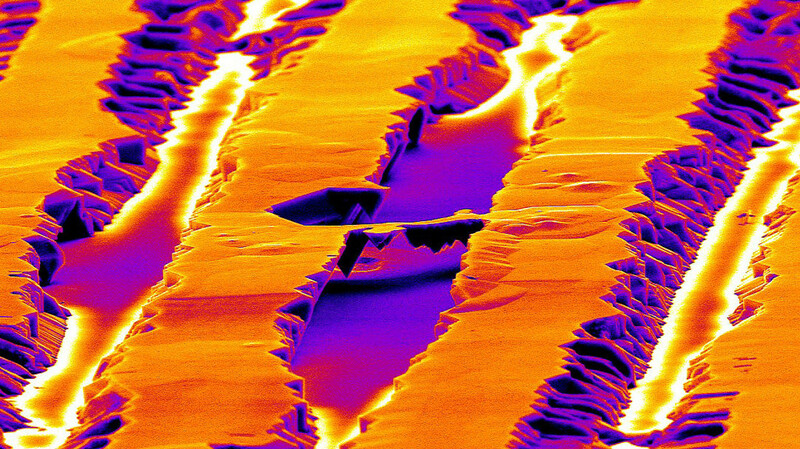 It is a false-colored field emission SEM image of an etched Gallium Nitride thin film structure that was grown on a crystalline sapphire wafer. The etching primarily occurs in the stripe-shaped domains with one crystal polarity (=direction of crystal growth), leaving only the banks with opposite crystal polarity behind. 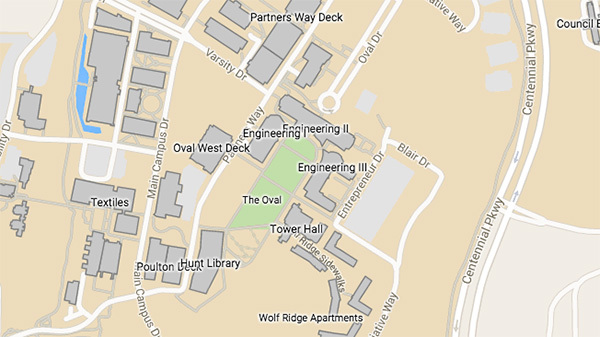 A bridge-like structure and several "caves" can be seen in this image that was taken at the AIF at NC State University. Some of science’s most powerful statements are not made in words. 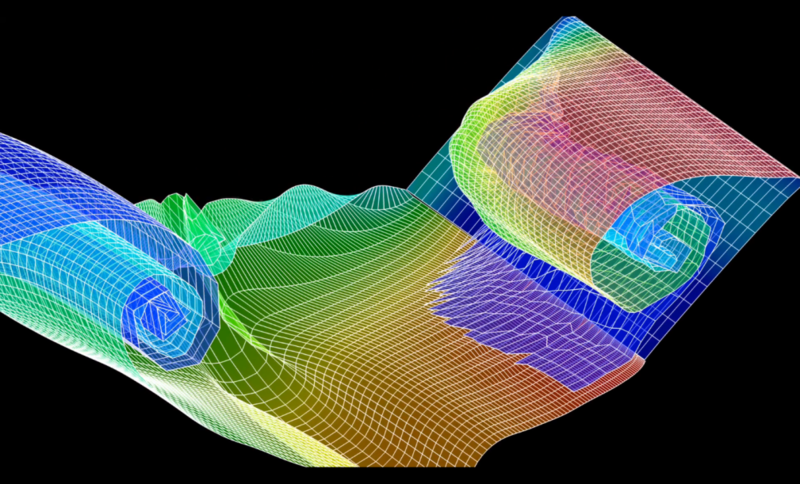 Visualizations express a human dimension and help create a universal language that enable people around the world to exchange knowledge and to more fully understand complex scientific ideas. 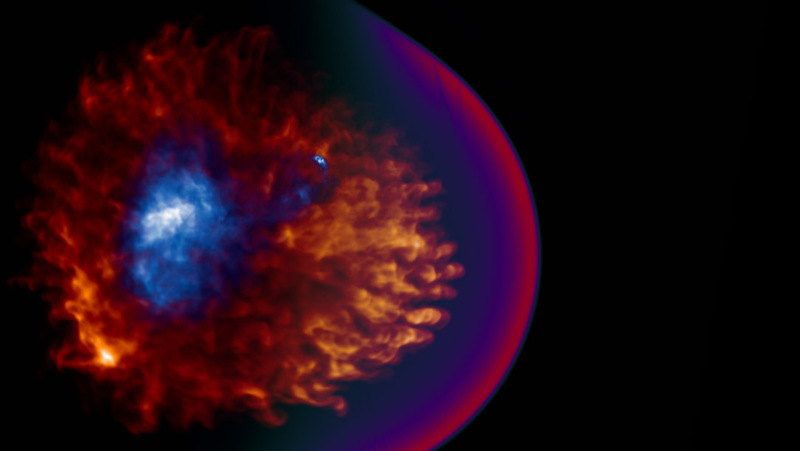 Description: The aftermath of a powerful stellar explosion: This rendered image depicts a core-collapse supernova remnant which houses a wind of charged particles (blue), produced by a rapidly rotating neutron star; simulated out to an age of 17,400 years. A powerful shockwave (red/purple) created during the explosion continues to expand and sweep up interstellar material, with stellar ejecta (red/orange) following close behind. This unedited confocal laser scanning microscope gif of a polymer film composed of a special type of Polyhedral Oligomeric Silsesquioxane (POSS) and solvent-casted with PEO (Polyethylene oxide) was obtained with topographical setting. Note the segregated hexagonal (honeycomb-like) phase domains (orange-colored), formed by POSS walls. This is the first observation of segregated hexagonal (honeycomb-like) phase domains produced in a polymer film by non-covalently bonded POSS. We are beginning to understand the driving force(s) behind these hexagonal shaped domains, which appear to be related to why honeybees build their honeycombs in identical orientation. The honeycomb shape minimizes the surface area/volume ratio and uses the least amount of wax for maximal honey storage. What better way to spend the summer than reviewing research images submitted by graduate students and postdoctoral scholars? A team of communicators and faculty from College of Sciences and the Graduate School came together to launch the university's first image contest in summer 2016. Description: This video depicts cancer cells moving through fluorescent blood vessels. 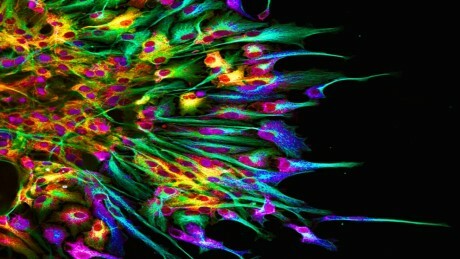 The cancer cells are red, and the blood vessels are green. Cancer cells were injected directed into the blood stream and then imaged over 16 hours. Cancer cells that move through the blood stream are extremely dangerous. Description: What can be learned by watching a swan landing on water? Actually this video demonstrates our theory by simulating the swan descending, and it successfully captures the time-dependent variation of the leading and trailing edge vortex around the flapping wings. Our new concept succeeds in predicting the time instant and the three dimensional distribution of the leading edge vortex. In addition, the lattices indicate a distributed vortex core and the colors found in the video range from the blue symbolizing the weakest to the red showing the strongest parts. Each vortex core induces the velocity around them and its integration forms the flow field. While it is known that the vortices, shed from the leading edge of the wing, play a determining role in the aerodynamic performance of flapping wings, the mechanism it uses is still uncertain. The biggest problem for the contest committee was selecting just two winners from each of the three categories. So we decided to name two honorable mention winners for each category. You can see their entries in the galleries and YouTube.